We’re convinced that shutters are perfect for your home office. (Actually they are also perfect for a non home-based office too – if you are a trade customer please read more in our trade shutters page). We’ll try and convince you too with our top reasons to choose window shutters for your home office. Why use home office shutters? Working from home can be very difficult in today’s world full of distractions. Whilst home office shutters won’t do anything to help with going on Facebook or Instagram they can really help with visual distractions. If your home office overlooks the street you can eliminate movement from outside from distracting you by simply tilting the slats slightly. This will allow light to enter the room while also making it hard to see movement and distractions from outside. It’s difficult to achieve the same with curtains or thin slatted blinds as they may flap around with open windows and also block too much light from entering the room. Speaking of light it’s essential to have natural daylight entering your home office. Whatever type of work you do from home natural daylight is beneficial for efficiency and productivity according to this article on Architectural Lighting and they would know. All businesses concentrate on being efficient, especially when working from home where it’s all too easy to stop and do something else. Cutting out the glare with shutters is easy too, so as the sun moves around during the day, so can your shutter slats be adjusted. 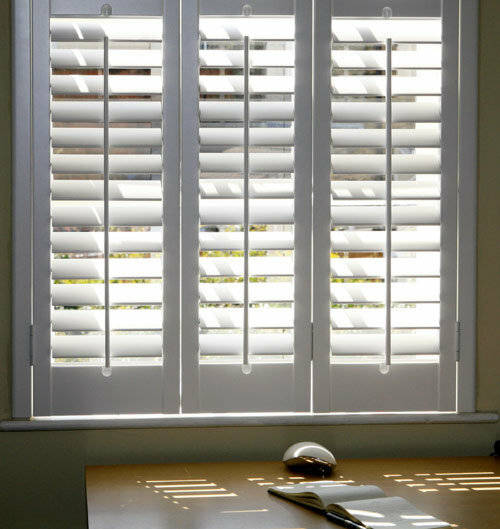 So shutters will help aid concentration and motivate you to be as productive as possible for most of your day. A tidy space makes a tidy mind. According to Life Hacker tidiness will benefit all manner of aspects of concentration and productivity. So how do shutters fit in with this? Window shutters provide clean linear coverings for your windows. There are no flaps, no excess material, no jangling or loose net curtains. Simply beautiful, clean straight lines, which create a decluttering effect on home office windows. This in turn can help inspire you to keep office clutter to a minimum, promoting clear uncluttered ideas and thoughts to help your business succeed. If you are working in creative fields such as design, writing, video making or similar, you’ll know how important it is to be creative in your business. Home office shutters can help stimulate creativity with their customisation and colour mixes. If your office is predominantly clean neutral tones try a similar hue with our off white colours. If you have a bold creative streak why not colour match and accessories with your choice of colours? Read more about ‘what colours do shutters come in’ here. Following on from decluttering we all know how fabulously important storage and shelving is, especially in the home office environment. Paperless we may or may not be, but there’s a need for great storage in any office. Whether your solution is from leading Scandinavian giant retailers or bespoke solutions for your office, storage should be part of a home office solution rather than an afterthought. Make your storage clean and linear to match your interior shutters. Nice leading lines in a room will create space and homogenise your office design. For more reading about creating the perfect space for home working take a look at Entrepreneur here. 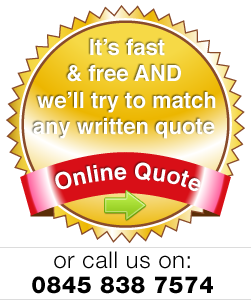 We want your business to succeed and we will help by matching any written quote you have for interior shutters! If you’re on the fence about whether home office shutters are the right solution for you, grab a free shutters quotation here and we’ll do our best to exceed your expectations!